The ancient market town of Hitchin was voted as one of the top ten places in the UK to live back in 2013, and its elegant market square and wealth of independent shops bear witness to an aspirational and thriving community. Over the years 1st Choice Security Systems engineers and installers have fitted electric gates for residential, commercial and industrial properties across the town, and we’ve noted on our many visits that the residents of Hitchin take a pride in their property, and have a positive, up-beat and proactive approach to neighbourhood crime. Many of our clients in Hitchin have recommended us to friends who were looking for automatic gates as an effective deterrent to opportunistic criminals, and we’ve even had occasions when the team has been approached in the middle of an installation to ask for a quote on driveway gates nearby. In this context 1st Choice Security Systems are actively encouraging any of our clients experiencing operating problems with their automatic gates to contact us immediately. 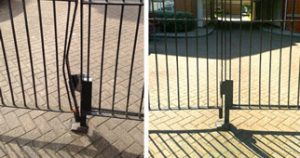 Broken or faulty driveway gates send out a clear message that security is no longer important to the residents the gates were once installed to protect. We make electric gates repairs a priority for that very reason, and we have a dedicated team who will respond immediately to any call received on our free 24 hour repair hotline. It’s all too easy to assume that once you’ve got automatic gates installed your security is taken care of. 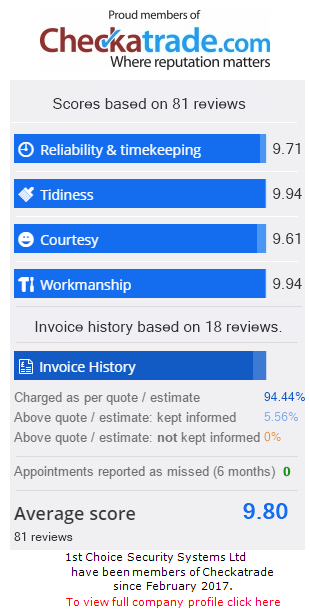 We always advise clients to purchase a maintenance package with their electric gates, in order to ensure that they get the maximum return on their security investment. Even if you haven’t been maintaining your gates, or if you have legacy electric gates requiring repairs, we will send experienced engineers to find the solution promptly – and get your security back on track!